Lesson #3: The dangers of post-secondary education. 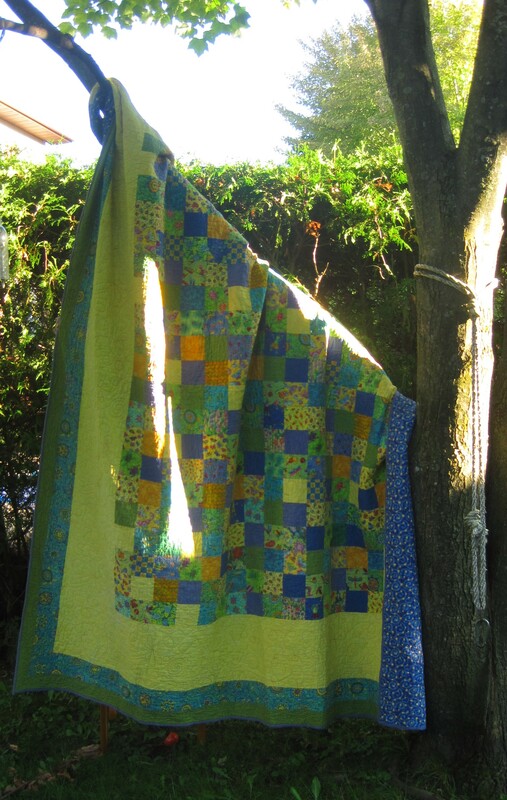 At 13, I made my first quilt. 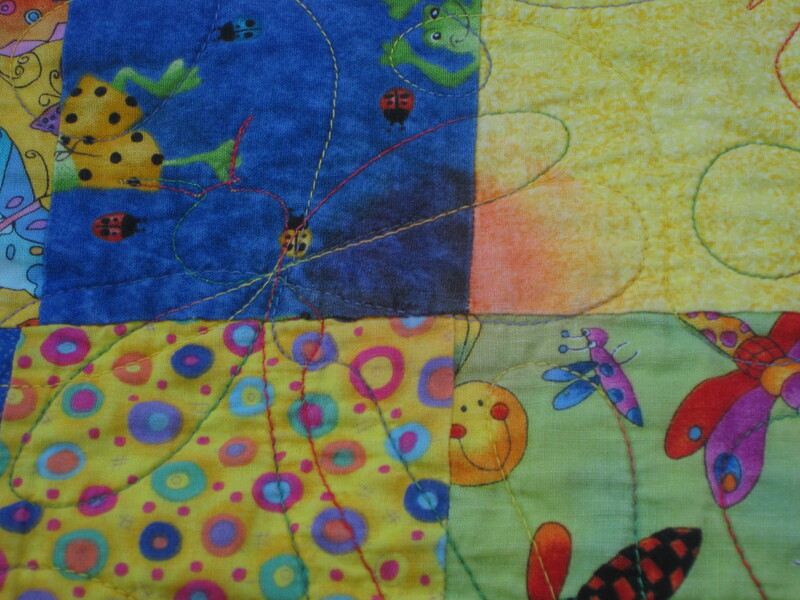 Simple squares, bold colours, bug-shaped variegated quilting. It covered my bed successfully for 4 years without incident; warm, cozy, …and undamaged. And so it came along when I went away to university. Kept me warm in my very cold and drafty apartment. I took to studying in bed, wrapped up in this bright reminder of home and free time. Wrapped up, cozy warm, with study notes in one hand and a bright orange highlighter in the other. So cozy that I frequently fell asleep among the sprawl of academia and cotton and uncapped highlighter. It turns out that orange highlighter is surprisingly difficult to get out of the quilt. Fortunately the colours are so busy that it takes a little while to spot the …spots. (There are at least 4 stains). I would like to say I conquered the urge to fall asleep without a writing instrument in hand but unfortunately I have to admit to a brief phase with a green liquid ink pen. On the plus side, I now always know which sheets are mine. 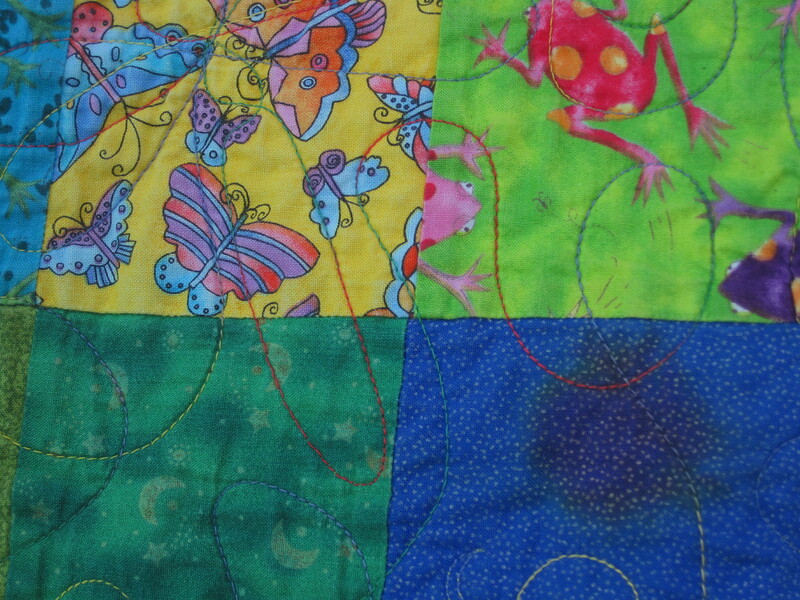 I had two baby quilt tops that had been sitting in my sewing room for almost year, waiting to be quilted. I had limited time on the long arm machine this weekend so my mom suggested loading both on the machine frame to speed up the process. I was skeptical at first, but I thought I’d give a try. 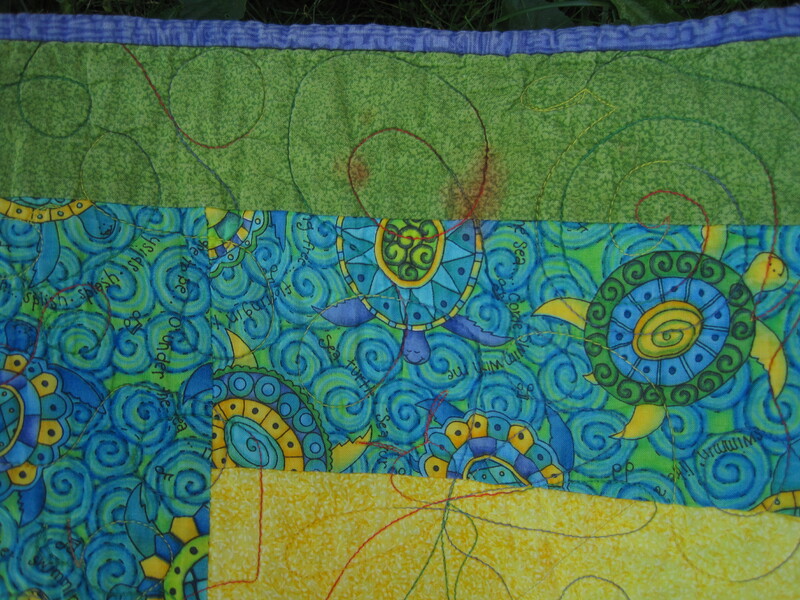 Here’s what I did: I sewed the backings together. They each had about six inches to play with on the length so I wasn’t too worried about losing some fabric to the seam. I basted the two tops together so I could separate them on the frame. I loaded the backing and double-top onto the frame. 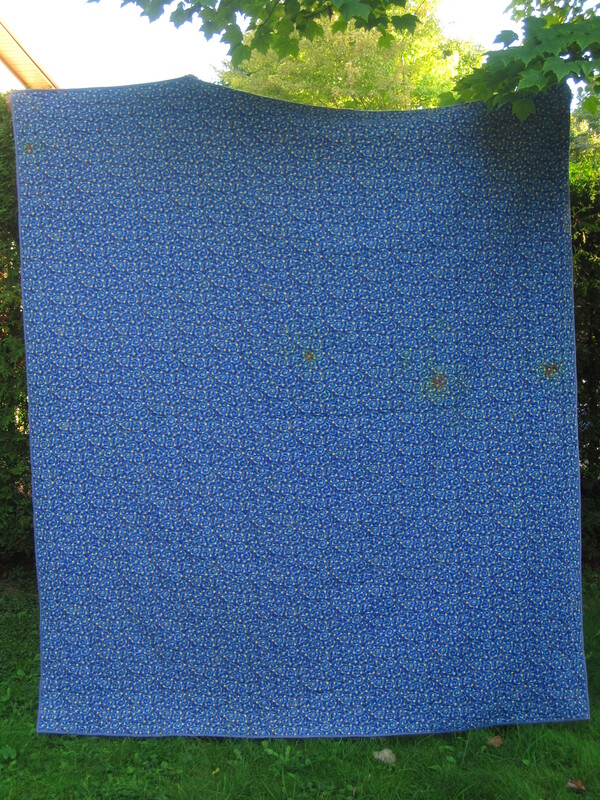 I think my math was non-functional when I made the first backing, so it was the same width as the quilt top. 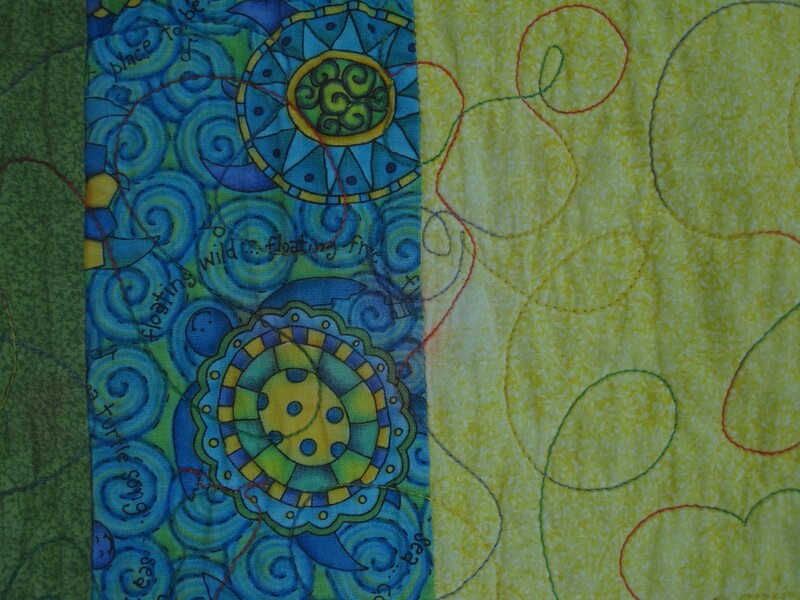 To make sure these lined up, I loaded everything so that this quilt would be done first and had to be extra careful of the edges. The bungee clips got in the way a lot, so I will probably trim these edges about an inch so that it looks nice. 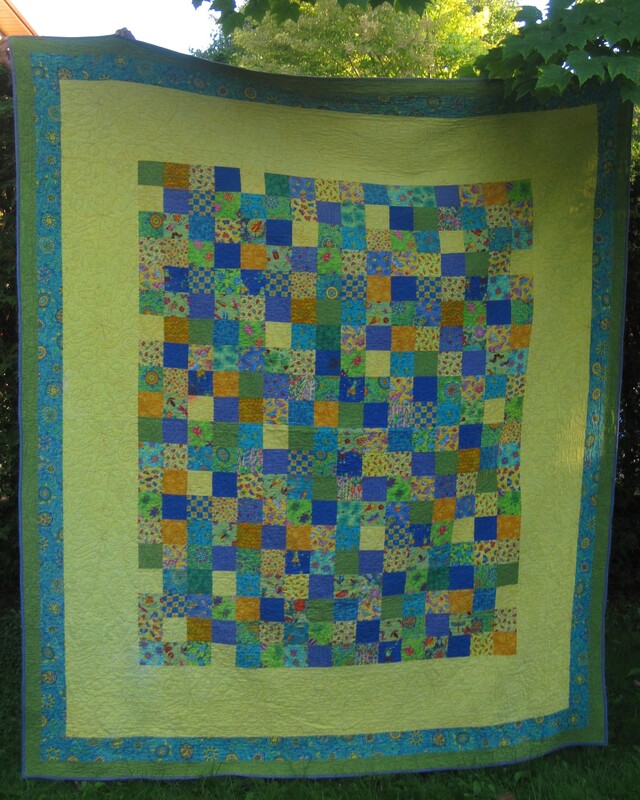 I proceeded to quilt as normal until I got to the end. 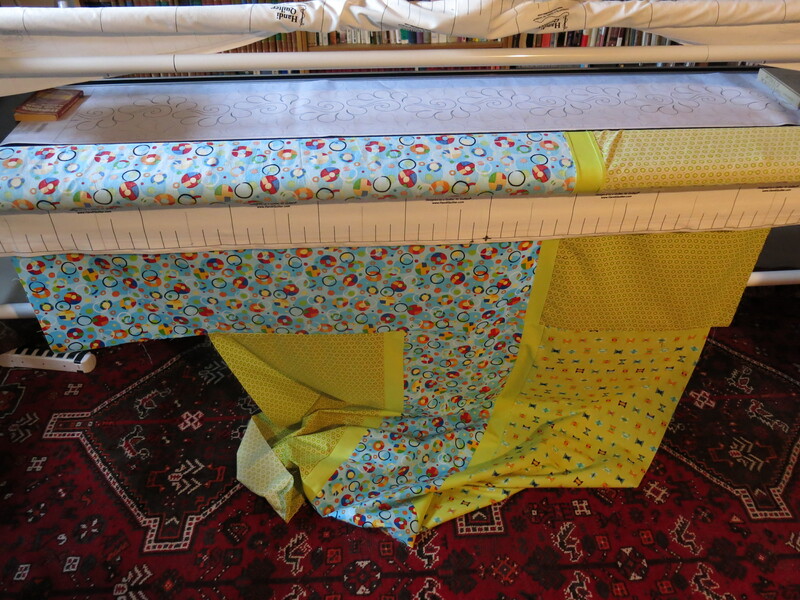 At this point, I took out the basting and rolled the second quilt back out of the way and finished quilting the first top. 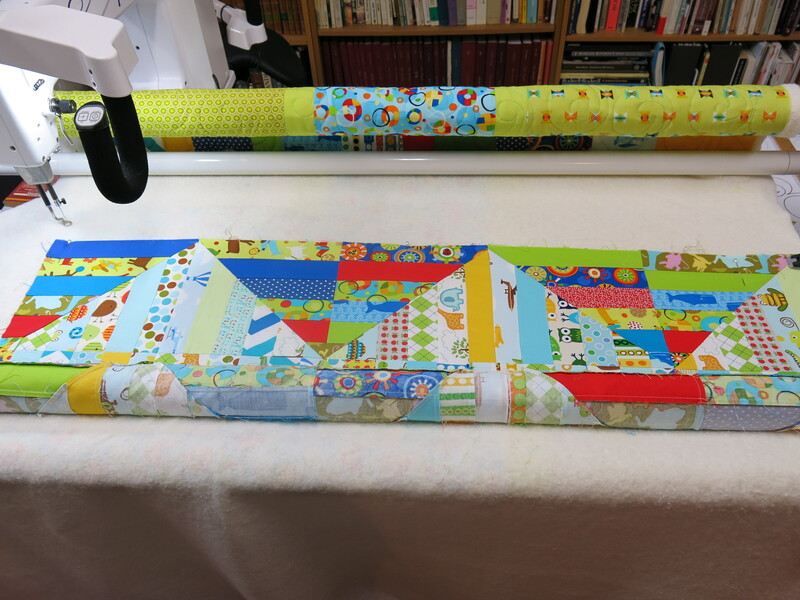 From here, it was easy since all I had to do was pin the second quilt and continue the machine quilting as if it was the only one on the frame. 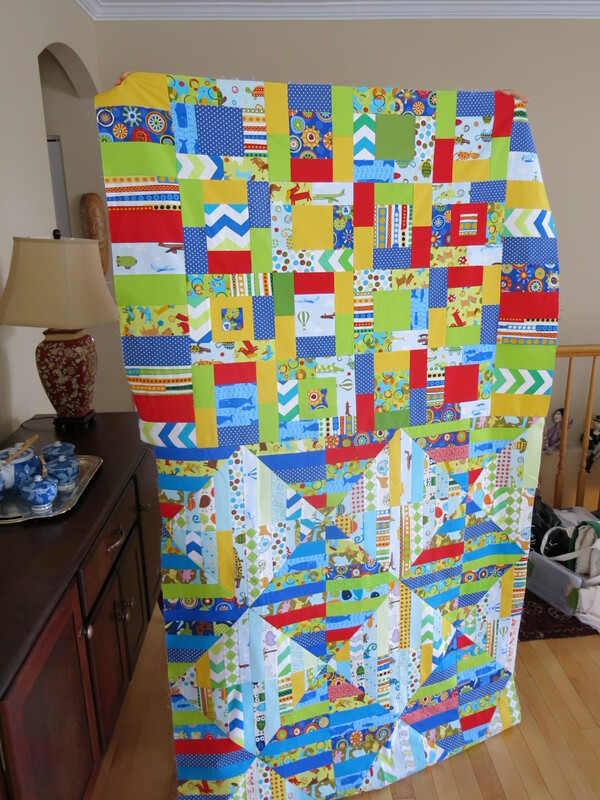 A few hours after loading both quilt, I was finished and had one mega-baby quilt! All that’s left to do now is to trim the excess fabric and batting and bind the edges. I do think it was quite a bit faster, and it’s nice to set up the machine once and keep working through. I promised to credit my mom (Michèle) – so thanks for the time-saving idea, Mom! I will definitely be doing this again! p.s. 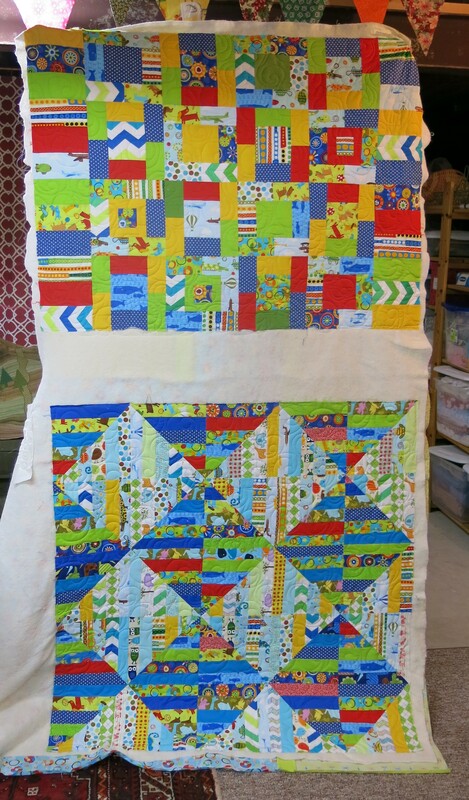 These quilts are numbers 19 and 20 tops completed on the long arm machine since we got it last summer! 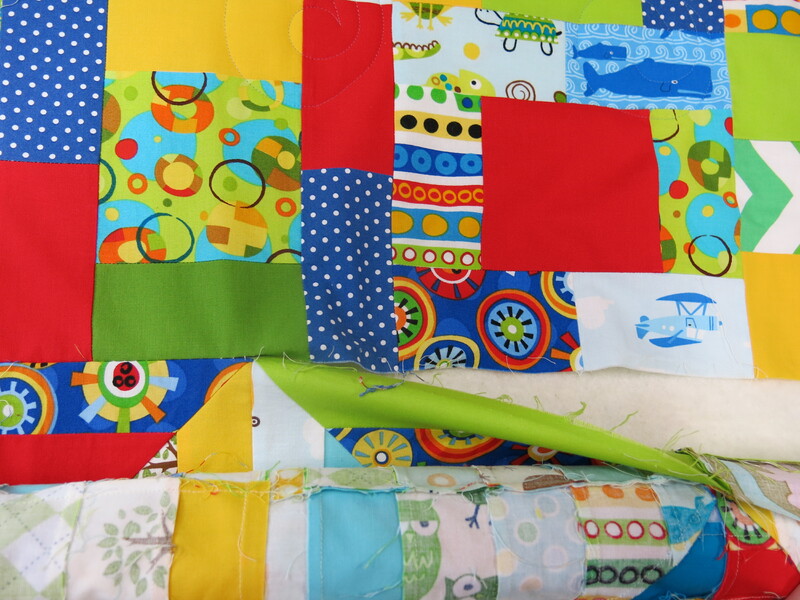 When thinking about what I’ve learned so far from quilting, there is enough material to fill several volumes. There is one incident that comes to mind, since we’re always told ‘Safety first!’, for the first lesson I suggest that you are always aware of where you have fingers (and thumbs!) in relation to all your tools like rotary cutters, sewing machine needles or anything else that could cause injury. There are two stories that back up this lesson. On one occasion, M found herself missing the tip of her finger during an intense cutting session. Rotary cutters are very sharp and can cut quite deep before you realize what has happened. Fortunately not too much damage had been done and I think she consider herself recovered and (mostly) whole. The next occasion happened to me on Christmas Eve. In my mad rush to finish last-minute gifts, my thumb got caught in a pocket of a bag I was sewing. After assessing this situation, I determined that the needle has gone through my thumb and had to unscrew the needle from the machine. Not quite sure what to do, SB and I stabilized it and went to the ER. Given I was in pretty good spirits and in not too much pain, the nurses all thought it was a pretty funny injury. 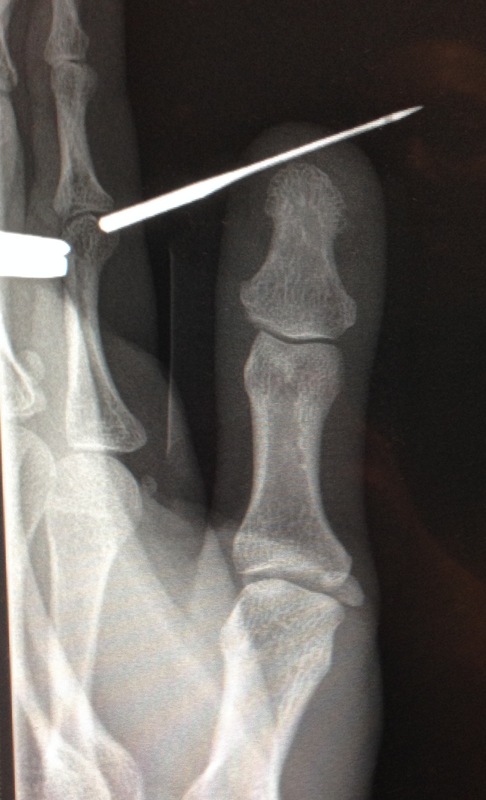 The needle and thread were soon removed and I got early Christmas gifts of a tetanus shot and a lovely portrait of my thumb bones (see below). We have been lucky that our injuries have been pretty minor, but our experiences serve as a reminder that we do use potentially dangerous equipment and that it’s important to be conscientious of our surroundings. Lesson learned!